Tanking isn’t over, but the NBA has tweaked the lottery system in advance of the 2019 NBA Draft in order to discourage teams from getting in an intense race to the bottom of the standings. The big change: The teams who finish with the three worst regular-season records will each have a 14 percent chance of getting the No. 1 pick, which every reputable draft expert believes will be used to select Duke’s Zion Williamson, a point-center with preposterous athleticism and superstar potential. After the top (or bottom, I guess?) three, every lottery team’s odds gradually decrease. If you finish fourth in what we’ll call the “tank standings,” you will have a 12.5 percent chance of getting the No. 1 pick; fifth, 10.5 percent; sixth, 9.0 percent and so on. Critics of this particular lottery reform argue that the league has not eliminated the incentive to lose and, if a change was going to made, it should have been a more radical one. Supporters argue that this is an improvement on what was in place before, and, as long as there is going to be a draft, all the Board of Governors can do is make relatively minor adjustments to the odds. 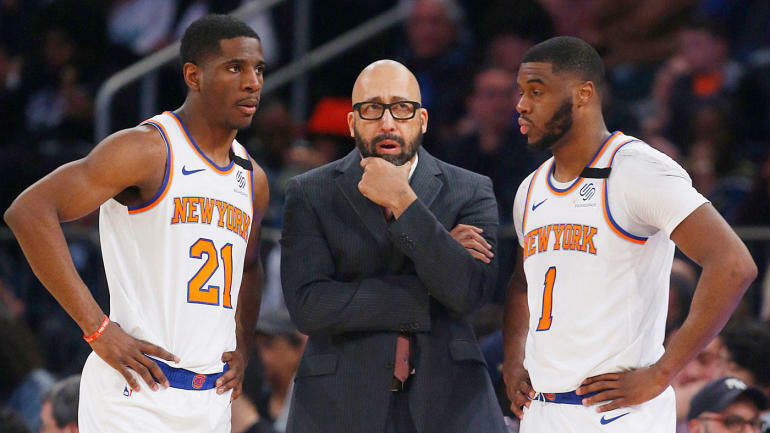 And with the regular season officially in the books, it’s the New York Knicks (17-65) who clinched the league’s worst record and, therefore, the top lottery-draw position. Finishing behind them with equal odds at the No. 1 pick are the Cleveland Cavaliers and Phoenix Suns, who end up with identical 19-63 records. Rounding out the top five are the Chicago Bulls (22-60) and Atlanta Hawks (29-53). The NBA Draft Lottery will be held on May 14. The NBA Draft will follow on June 20.